This week’s course is: “Introduction to Caring Ministries”. 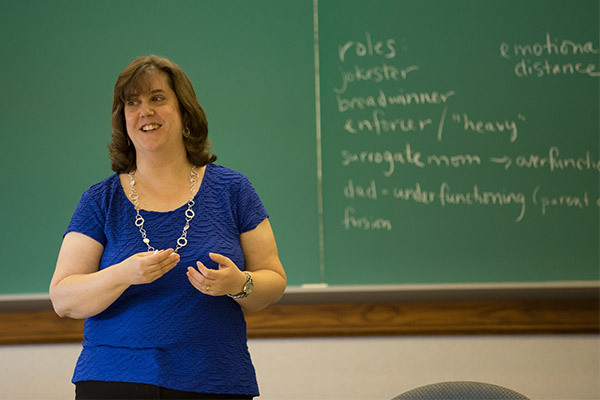 Professor Leanna Fuller teaches MDiv, MA, and Doctor of Ministry students at Pittsburgh Seminary. This term, Pittsburgh Theological Seminary students will be learning about a specific aspect of ministry with the Rev. Dr. Leanna Fuller in the class “Introduction to Caring Ministries.” This is a required course for second year students in the Master of Divinity (MDiv) degree program and can also satisfy a requirement for the Master of Arts in Pastoral Studies (MAPS) degree. Introduction to Caring Ministry is available to students in the Master of Theology (MTS) program as well. In “Introduction to Caring Ministry,” Dr. Fuller introduces students to the theology and practice of caring ministry. The class also pays special attention to pastoral self-awareness and key relational skills. Students in the class will develop their capacity to understand and discern the needs of persons and communities and will also determine appropriate responses to those needs. The course provides a chance for students to explore the intersection of leadership and care through the study of organizational dynamics and group processes. By the end of the class, students will have an enhanced understanding of pastoral theology and pastoral care and their relationship to one another. Students will also explore and reflect on their Christian identity as caregivers. Dr. Fuller teaches students basic principles, theologies, and theories that ground pastoral care and how to use them to guide and critique their own ministry. Through the process, participants begin developing a practical expertise in the art of pastoral care through skill-building and reflection. As to required texts, Dr. Fuller uses Debora van Deusen Hunsinger’s Pray without Ceasing, Sheryl A. Kujawa-Holbrrok and Karen B. Montagno’s Injustice and the Care of Souls, Emmanuel Lartey’s In Living Color, Ronald W. Richardson’s Creating a Healthier Church, and John Savage’s Listening and Caring Skills. In addition to the textbooks, Dr. Fuller assigns pertinent articles from time to time. Coursework typically includes short reflection papers, case study responses, and a final paper. A graduate of Vanderbilt University (Ph.D.), Vanderbilt Divinity School (M.Div. ), and Furman University (B.A. ), the Rev. Dr. Leanna Fuller is in her element when teaching about caring ministry. Ordained in the United Church of Christ, her most recent book is titled When Christ’s Body is Broken: Anxiety, Identity, and Conflict in Congregations (Wipf and Stock, 2016). Fuller has earned numerous fellowships, awards, and honors. She concerns herself with church conflict, and her book uses two case studies to examine the issue toward constructive outcomes. Fuller advises pastors to develop an intentional plan for dealing with congregational conflict—before the conflict arises! Some of the first steps, she says, include acknowledging that anxiety will be present in such circumstances and that the more serious the conflict the more time it will take to resolve it constructively. As clergy, we find that we are constantly asked to be experts at tasks and we’re unprepared—plumber, roofer, fundraiser, cleaner, social media expert, copier repair person, barista. Tasks we spend years preparing for in seminary revolve around divinity and theology. Tasks many of us hope we are prepared for revolve around care and counseling. Theology and counseling. We desperately want to make a difference as pastors. We are called by God to spend our lives and our careers telling people about the love of Jesus Christ. It just so happens that nearly all of the people we tell are hurting. And we desperately want to pour ourselves into fixing that hurt. There is a difference between pastoral care and counseling. Pastoral care is walking with someone in their time of trial, hurt, or misfortune. Counseling is problem solving. Counselors have a care plan and a care team to make sure that they are meeting the goals of their plans with their clients. Counselors have brief relationships with clients. Counselors do not walk through life with their clients like pastors do. Counseling is a brief (a few months or years) relationship with someone focused on a malady in their family system or their emotional state. Counseling is seeing tangible results. And it is incredible to see results. These are results that often evade us in parish ministry. As a pastor walking with congregation members, we naturally come in contact with a variety of social service systems. Hospitals, Medicare, Medicaid, Social Security, suicide hotlines, nursing homes, schools, child services, and the justice system to name a few. Because of our exposure, people oftentimes look to clergy as experts in a subject that we are learning to navigate ourselves. Here are some tips for congregation members as they navigate unknown social service systems. Most people encounter social service systems, whether for children, adults or the elderly in times of stress. If the person in need of the service is under great stress, is too young, or is ill, it is important that someone who can be calm stay a part of the conversation. You must be able to listen, not just hear what the services are saying. Even the most competent social service employee will miss something in a conversation regarding a system. Bring someone along with you to your appointments; have someone with you when you register online. Don’t do it alone. You will miss something. When meeting with a healthcare, financial, social security, or child welfare system, take notes. Date your notes. Document what you are to do next and what the system is to do next. Follow up if things are not acted upon as you expect. 4. Come with questions written down. Spend three minutes before your appointment, discharge, etc. and list questions that you have. Write them down. When the doctor, social worker, or case manager asks, “Do you have any questions?” say “YES.” Everyone should have questions when heading into an unknown system or situation. If nothing else, ask for information on who to contact when you have questions after leaving the appointment/hospital. Be your own advocate and advocate for your friends and loved ones. The only way we can advocate for one another is if we let each other into our health, financial, and social needs. Trust your neighbor, mother, child, or friend when they tell you something is wrong. And do everything you can to work out the problem with them. 6. Connect with a social worker. Find a local social worker who can be on call for your congregations needs. Most congregations have a social worker who attends, or someone will have a connection. The social worker will be able to help congregation members navigate the systems. The role of pastor is so unique. No counselor, social worker, or social service is invited into the fullness of life in the way pastors are. In this unique role it is important to know our limitations and lean on experts who can help us and our congregants navigate some of life’s most frustrating and frightening moments. It is part of the honor and responsibility of walking with others and pointing to our Lord and Savior Jesus Christ. Within the ministry of pastoral care, healing from brokenness is a central goal, both for individuals and for the families of which they are a part. Although pastoral care can certainly be extended at times of great joy in a family’s life (such as at the time of a marriage or the birth of a new baby), families most often feel the need for pastoral care and counseling during experiences of brokenness in their lives together. Of course, brokenness within a family may take many forms: caring for an elderly parent; grief following the death of a loved one; divorce or familial estrangement; the loss of a job; abuse or violence. In the midst of such experiences, individual pastoral caregivers and caring faith communities are called to facilitate healing in families’ lives. 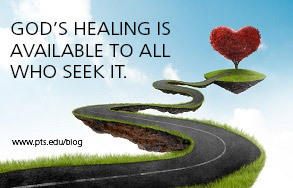 Healing, in this sense, focuses on the restoration of wholeness and fullness of life, and does not necessarily mean “cure.” In other words, it may not always be possible to fully restore a family’s health or wholeness, or to reverse the family’s current situation in any meaningful way. Instead, in this way of thinking, healing means helping people overcome an impairment by helping to lead them to a place beyond their previous condition. It may also mean assisting families to move to a higher level of spiritual insight and awareness of God’s love by integrating their experiences of brokenness with their faith. Developing a pastoral care network in your congregation so that lay people can be trained to care for one another more effectively, even as care is also provided by those serving in official pastoral roles. Stephen Ministries is one of the most comprehensive and well-respected programs for training members of faith communities in pastoral care, but there may be other good programs available in your area. If you’re not sure where to start, consider contacting the local judicatory staff for your church’s denomination to see if they have specific recommendations. Including attention to the reality of family brokenness in the worshipping life of the community, perhaps by naming some of these struggles in the prayers of the people, in pastoral prayers, or in sermons. For many families, having their challenges acknowledged (in a general way) in worship helps them to feel less alone, and to let go of the notion that church is for perfect people. One of the most powerful ways of helping families heal may simply be communicating, in worship and in other places in the congregation’s communal life, that you don’t need to “have it all together” before coming to church. Hosting support groups in your church for various kinds of family issues (grief, divorce, parenting, etc.) You may have people on your congregation’s staff with the expertise to run these groups themselves, or you may simply wish to invite community organizations to consider holding their support group meetings in your space and making sure your members know such groups are available. Either way, this can be another important means of conveying that the church is a place for people to bring their whole selves, and that healing can be found in the midst of the faith community. Just as family brokenness can take many forms, healing from brokenness can take many forms as well. The key is to figure out what kind of healing work makes most sense in your own ministry context. In the end, the goal is not to take one particular approach in our ministries of pastoral care and counseling, but simply to make sure we are communicating—as individual caregivers and as caring Christian communities—that the lives and struggles of families are important to us, and that God’s healing is available to all who seek it. The Rev. Dr. Leanna K. Fuller is assistant professor of pastoral care at Pittsburgh Theological Seminary and teaches in the MDiv Program. Her ministry experience includes serving as associate pastor of Oakland Christian Church in Suffolk, Va., where she coordinated youth ministry and Christian education programming. She writes regularly on pastoral care and counseling, pastoral theology, and congregational conflict.